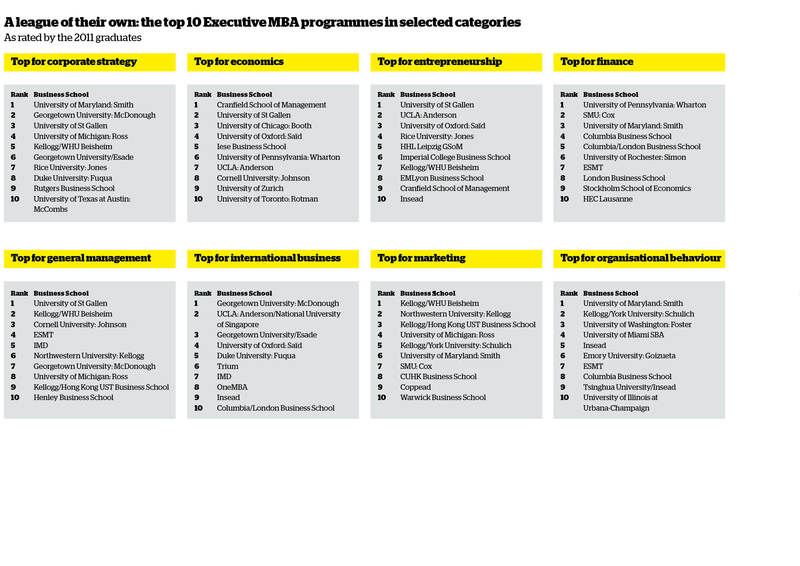 Could an Executive MBA help you in your career? Read advice from our experts, including Peter Tufano, dean of the University of Oxford Saïd Business School in the UK. Find out more about FT data with our slideshow. Table notesAlthough the headline ranking figures show changes in the data year to year, the pattern of clustering among the schools is equally significant. Some 210 points separate Trium at the top, from the school ranked number 100. The first 17 business schools, from Trium to Shanghai Jiao Tong University: Antai, form the first tier of schools. The second tier is headed by the National University of Singapore Business School, about 90 points above HHL Leipzig Graduate School of Management at the bottom of this group. Vlerick Business School heads the third tier. 7. This combines two pieces of data. The first is the percentage of participants who are resident in the country of the business school but whose citizenship is different to that country. The second is the percentage of participants who are resident outside the country in which the business school is situated. 9. International course experience: The percentage of classroom teaching hours that are carried out outside the country in which the business school is situated. The data is presented as a rank and the top position is one. 10. Number of languages students are required to speak on graduation. 12. This is calculated according to the number of doctoral graduates from each business school during the past three years. Additional points are given if these doctoral graduates took up faculty positions at one of the top 50 full-time MBA schools of 2013. 13. This is calculated according to the number of faculty publications in 45 international academic and practitioner journals. Points are accrued by the business school at which the author is currently employed. The total is weighted for faculty size.